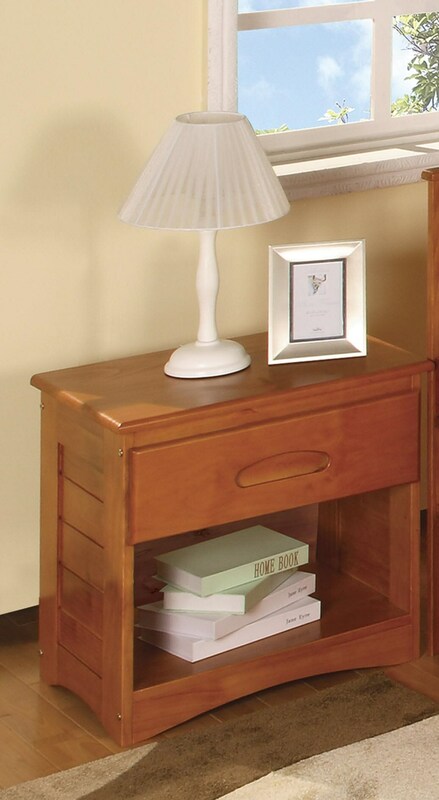 Accent your child's bedroom with this charming nightstand. The simple casual design features one storage drawer and open cubby perfect for books, room decoration, and bedside accessories. Finished with an inset finger pull drawer front and a rich honey finish with a lacquer top coat. The Honey Nightstand With Drawer And Cubby by Discovery World Furniture at Virginia Furniture Market in the Rocky Mount, Roanoke, Lynchburg, Christiansburg, Blacksburg, Virginia area. Product availability may vary. Contact us for the most current availability on this product. The Honey collection is a great option if you are looking for furniture in the Rocky Mount, Roanoke, Lynchburg, Christiansburg, Blacksburg, Virginia area.